Guests appreciate simple, authentic ingredients. Pure Leaf® Tea is made with the finest. Real tea, real ingredients, real flavor. 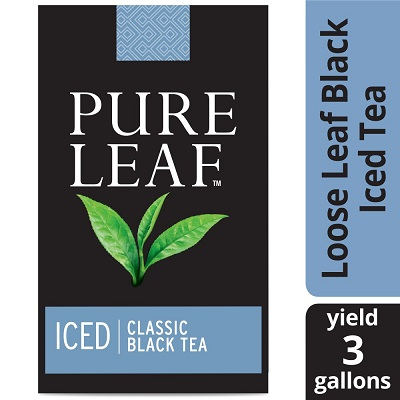 Made with premium long leaf tea leaves, Pure Leaf Loose Iced Black Tea makes a crisp and refreshing cold beverage your guests will appreciate. Ideal for restaurants and cafés, this iced tea features high grown Kenyan black tea leaves that deliver a clean flavor with a distinct floral aroma and smooth aftertaste. All Pure Leaf tea is sourced from Rainforest Alliance Certified tea estates around the world. The black tea leaves are simply picked, rolled, and crafted for an exceptional flavor that will please any tea lover. This bulk iced tea case includes enough loose tea to make thirty-two 3-gallon batches of iced black tea, making it a great choice for commercial use. Brew in hot water using filter until desired strength is reached. See manufacturers’ instructions for further preparation details. Pure Leaf uses tea leaves that are simply picked, rolled, and crafted deliver an exceptionally pure tea flavor and aroma. Pure Leaf tea is calorie free (when unsweetened), has no additives or colors, and helps to keep you hydrated. Sweeten to taste with sugar.